Gift of S. Reid Warren, Jr., conveyed in six parts, April 9, 1976, January 1977, February 16, 1977, May 1986, May 12, 1989, 1 May 1992. The papers of S. Reid Warren, Jr., a professor in electrical engineering at the University of Pennsylvania, are organized in three series. They are Correspondence, Personal Papers and Professional Papers. The Correspondence series, 1935-1989, (.5 cubic ft.) has two parts: one with letters arranged chronologically and the other arranged alphabetically by correspondent. The Personal Papers, 1923-1985, (.25 cubic ft.) is arranged alphabetically by subject. The Professional Papers have the following subseries: University of Pennsylvania material, 1936-1988, (1.5 cubic ft.); Professional Organizations, 1942-1986, (1.25 cubic ft.); Professional Trips, 1952-1972, (0.25 cubic ft.); Speeches, 1950-1980, (0.25 cubic ft.); Writings, 1930-1986, (0.25 cubic ft.); Reference Material; Engineers Certificates, 1945-1991; Awards, 1974-1978; Miscellaneous; and Glass Lantern Lecture Slides (0.25 cubic ft.). The University of Pennsylvania subseries is broken even further into Lecture Notes, School of Engineering and Allied Sciences, and University Committees. These subseries, with the exception of Professional Trips, Speeches and Writings, are ordered alphabetically by subject. The exceptions are arranged chronologically. Samuel Reid Warren, Junior, was born on January 31, 1908 in the Mount Airy section of Philadelphia, the son of Samuel Reid and Lora (Chandler) Warren. In 1924, S. Reid Warren, Jr., entered the newly formed Moore School of Electrical Engineering at the University of Pennsylvania. Through a scholarship and summer jobs with the J. C. Holtby radio store in Lansdowne, Philadelphia Electric Company and Bell Telephone, he was able to continue his studies at Penn. In 1928, Warren received his B.S. in Electrical Engineering. Though tempted, as many of his class were, to begin working for private industry, Warren was persuaded by Harold Pender, the Dean of the School, to continue on in the graduate school. This decision marked the beginning of his long career with the University of Pennsylvania. The following year, 1929, Warren was granted a Master’s degree in Electrical Engineering. Again encouraged by his teachers and the dean, he progressed through the doctoral program. With the onslaught of the depression, Warren was forced to prolong his studies. It was not until 1937 that he finally received the Sc.D. in Electrical Engineering (the University did not grant PhD’s in electrical engineering at this time). At the beginning of Warren’s doctoral studies, he became involved the field of biomedical research or development. Charles Nathan Weyl, then an assistant professor in the Moore School, had been approached by Dr. F. Maurice McPhedran of the Henry Phipps Institute of the University of Pennsylvania to assist McPhedran in the operation of x-ray machinery. Weyl agreed to help McPhedran. Knowing that Warren was entering the doctoral program, Weyl asked Warren to join him in this new research. So, in 1929, Warren was hired as a research assistant by the Moore School. The research was funded by the National Tuberculosis Association and concentrated upon analysis of x-ray machinery and techniques applied to chest examinations. On Warren’s suggestion, the research team engaged in on-site inspections in tuberculous sanatoria throughout the United States and Canada. The partnership with Weyl was quite productive. By 1937, they had written one book and 15 articles on the subject. When Weyl assumed the responsibilities of the family’s printing business, he was to take a less active role in the project and Warren took over. Warren directed the research until 1944 at which time he became more involved in the Moore School. While Dr. Warren was doing his x-ray research, he also was teaching in the Moore School. He was appointed Instructor in 1933. 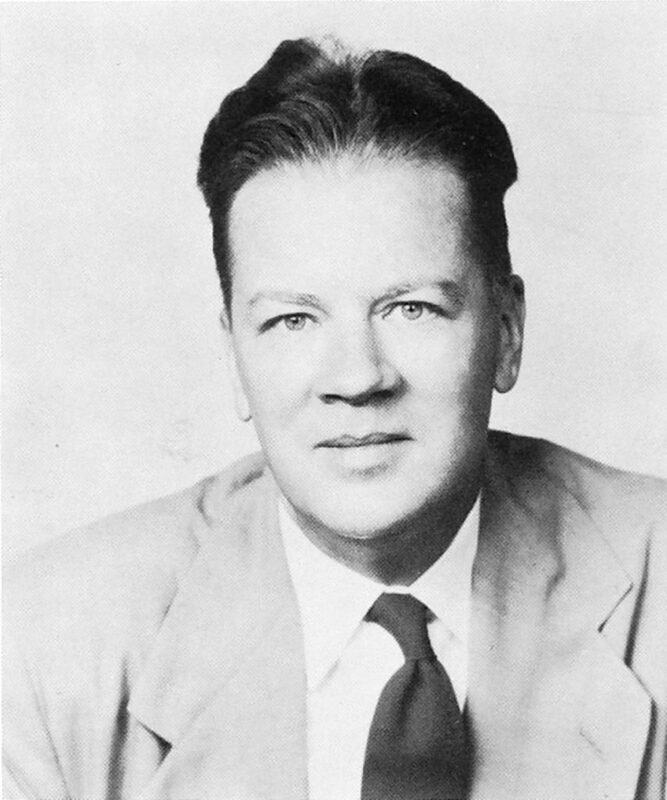 Due to his distinguished research and the respect of the faculty, Warren became an Assistant Professor in the Moore School and an Associate in radiological physics in the Graduate School of Medicine in 1939. The medical school course sought to familiarize physicians with the physics behind x-rays, an innovative idea for traditional medical education. This important work with the medical school lead to his advancement through their tenure system, assistant in 1942, associate in 1947, and full status in 1951. The trek through the Moore School, however, was slightly more rapid, associate professor in 1944 and full professor in 1949. Soon after S. Reid Warren’s full appointment in the Moore School, he entered into the administration as the Vice Dean 1951. Under the 1954 reorganization of the various engineering schools at the University of Pennsylvania into the Engineering Schools, Dr. Warren became Assistant Vice President (later called Associate Dean) for Undergraduate Engineering Affairs, a post which he held until 1973. Possessing a position great influence in the school, Warren had the opportunity to generate discussion and attempt implementation of his unique views on undergraduate engineering education. He saw the profession as becoming too specialized and isolated. He believed that the student should have a broad and well grounded education in the humanities, not just science. The ideal would be to have the student enter into concentrated engineering studies at graduate level, after completing a varied program in the university. By writing articles, participating in various university committees, Warren was able to disseminate his opinions. Though he was never able to attain this ideal, Warren did present these views for discussion among his peers. He was, however, able to stress the need for good student advising which he saw as the key to guiding young people in a broad education. Even after his retirement in 1976 from the College (now School) of Engineering and Allied Sciences, as it was then called, he continued to labor to this end by advising undergraduates. Though Dr. Warren retired from his teaching post at the University in 1976, he still work on a number a committees. After serving on the board of governors for a number of years, he acted as president of the Faculty Club from 1977 to 1979. He also participated in the Honorary Degrees Committee, 1978-1981. No doubt because of his long association with the school, Warren was chosen to arrangement and effect class reunions of old Moore School alumni. Dr. Warren was quite active in a number of professional organizations. He served on close to 15 committees for the American Institute of Electrical Engineers beginning in 1943. From 1954 to 1964, he gained international recognition as the secretary of Working Group 65, Definitions in Radiology and Radiological Physics under the Technical Committee of the International Electrotechnical Commission in Geneva. Another position which he held was as a member of the Franklin Institute’s Committee on Science and the Arts, which committee he joined in 1958. Some of the other organizations that Warren participated in included the American Society of Engineering Education, Engineers’ Council for Professional Development, and the Etta Kappa Nu Association, a fraternity for engineers. S. Reid Warren, Jr., married Marian Stradling on September 20, 1930 and they had two sons, S. Reid, III, and Alan. The S. Reid Warren, Jr., Papers primarily document his professional career in the field of electrical engineering and radiologic physics, and in particular his role as an educator. Dr. Warren’s vocation at the University of Pennsylvania represents the bulk of the collection. Though Correspondence Series, 1935-1989, contains a number of files which have exchanges between him and such University officials as Joseph Bordogna, Dean of the School of Engineering and Allied Sciences, and Gaylord Harnwell, President of the University, it is the Professional Papers which provided the greatest insight to Warren’s work at Penn. The Professional Papers contain letters, announcements, and notes, as well as a large number of committee related material. In addition to a small selection of lecture notes, Warren’s activities in the SEAS are well documented. The class reunion files, 1979-1988, which relate to the logistics and other arrangements for these functions evince Warren’s continuing involvement with the SEAS after his retirement. A good chronicle of his career is the video tape interview. Dr. Warren’s efforts to provide undergraduate engineering students with a well rounded education in the humanities are found in the numerous committee files, 1948-1979, such as those for Undergraduate Affairs Committee, Board of Engineering Education and Education Council. These files contain minutes, agendas, notes and correspondence. The undergraduate education and curricula section of the SEAS also is a good source. Since Dr. Warren gave a number talks on this subject, a large among of material is also in the Speeches subseries, 1950-1980. There are also manuscripts and proofs of articles on this subject in the Writings subseries, 1930-1986. His broad interest in education is also seen in the file of Education Committee of Episcopal Academy. The extent of professional associations of S. Reid Warren, Jr., can be found in the Professional Papers series, 1930-1991. The extant of these activities are documented in files for such organizations as the American Institute for Electrical Engineers, the Institute of Electrical and Electronics Engineers (IEE) and the International Electrotechnical Commission (IEC). His work on defining electrotechnical terms is the most complete portion of these papers. These files have correspondence with committee members, minutes, agendas, and various drafts of the final report. Documentation concerning Warren’s research work in the field of engineering is rather limited. Most of this material, especially his notes, are found in the Francis A. Countway Library of Medicine at Harvard. This collection, however, does have reprints of many of his early articles. There are also a number glass lantern slides used in lectures on radiologic physics. Dr. Warren’s interest in the history of technology is well documented. The files relating to the development of ENIAC/EDVAC, 1969-1984, contain material on this important project at the Moore School and Warren’s connection to it. Also the History Committee of the IEE papers, 1977-1980, which include correspondence and minutes, show his efforts to preserve the history of engineering. American Institute of Electrical Engineering. Data card for test of radiographic machines.